Banner stands offer arguably the best value for any type of display. They are highly portable, easy to set up, customizable with graphics and accessories and are fast and inexpensive to ship. Highly versatile, they can fit well in any size exhibit and can be used in a multitude of events and environments, such as meeting rooms, lobbies, trade shows and conferences, restaurants, airports, retail spaces and more! Banner stands can easily add branding and messaging in any space, no matter the size. 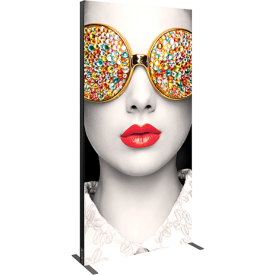 Browse a wide variety of stylish, quality banner stands - from retractable (roll up style), telescopic (variable height), spring back (X-banner style), fabric frame banners and backlit banner stands. All banner stand graphics are printed using state-of-the-art printing equipment and processes, ensuring that your graphics and message pop! Options are available for all budgets. Banner stands are offered at several prices, ranging from economy to premium, making it easy to find the solution that best fits your needs and budget. Choose from one of the widest selections of stylish banner stands, some with basic features and functionality, and others with lots of bells and whistles. Find the perfect banner stand today! 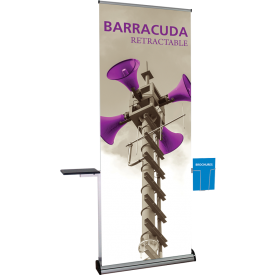 Retractable, or roll up, banner stands are one of the most popular displays available. 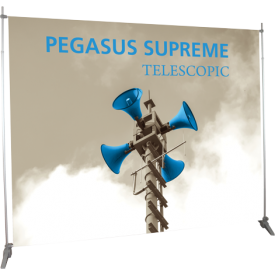 The banner easily retracts into the base, allowing for quick set up, storage and shipping. Browse a large selection of retractable banner stands available in multiple sizes and materials. The premium range of retractable banner stands come with a lifetime warranty and unique, high-end styling points, features and functionality; these stands can be used daily and are meant to last. Mid-range, standard retractable banner stands come with at least a five-year warranty and provide reliability, durability and ease of use. They are good quality, are affordable and incorporate sleek design features. The economy range of retractable banner stands provide basic design features, essentials and functionality at a low price point. These stands are reliable for limited multipurpose use. Telescopic banner stands can adjust in width or height to fit any exhibit space. A versatile solution for your next event. The perfect banner solution for any budget. 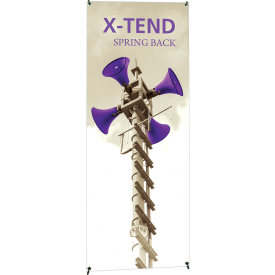 Spring Back X-Banner Stands are an economy option suitable for a variety of environments. Quality and affordability in one display. Tension Fabric Banner Stands feature high quality stretch graphics and are available in a variety of unique shapes and sizes. Banner Stands are available in Formulate®, Modulate™, and Vector Frame™ lines, which can be formed into a custom modular display. 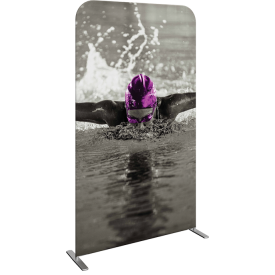 Highly portable displays available in single and double sided options. Make your messaging stand out from the competition. Vector Frame backlit displays use LED strip lighting to provide bright, effective messaging that delivers an impact in retail, events, trade shows and more! Ask your local Nimlok NYC center for a catalog. © 2019 Nimlok NYC. All Rights Reserved.